In early 2014 I was asked to design a door mat that would help raise money for cancer research; its an initiative through Carpet One called Welcome A Cure. Carpet One is the largest associated dealers of flooring products in North America. With over 1000 locations worldwide, this organization has been co-laberating with many talented designer for years; trying to raise monies for this very worthy cause. 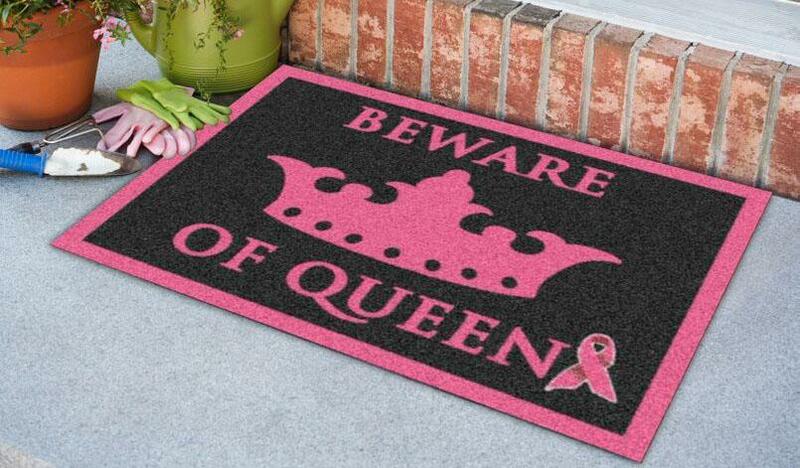 I wanted my door mat design to be cheery with colours that were on-trend in the home decor world, but also send a message of strength for all the women who have survived breast cancer. The mat is super-durable yet soft and plush- perfect for outside at the front door or even waiting patiently to be stepped on when you get out of the shower. Chances are we all know someone who has lived through, beaten or been taken by breast cancer; all of those women are Queens to me- ain’t nobody stronger!!! Here’s the rug I designed. It is now the highlighted doormat at all Carpet One dealers for the month of July 2015.